I like denim skirts and own a few, but only had one RTW one that was long enough to wear to the office. Unfortunately my hip and back measurements have <cough> altered a bit over the last 10 years. I would try to shimmy my way into it and in denial put it on a shelf until the day it would fit again. I'm not quite sure why I held on to it this long because I'm usually good about letting things go when I pair down my wardrobe. The one good thing that came out of keeping the skirt was that last year I learned that it's possible to "rub-off" a pattern. After taking the Craftsy Pattern Drafting from Ready-to-Wear (which by the way I found very helpful), this was the first pattern I wanted to tackle. The Pattern Preview skirt contest was the final motivator and I got to work recreating the pattern by tracing the original and using the pin method to line up the rest of the seams. I figured out the sewing order from what I already know about construction and by studying the original. The whole thing was definitely more time intensive than sewing from a pattern, but more educational too. The only disappointing thing was that even though I adjusted the new pattern to fit my current measurements and pre-washed the fabric, it still shrunk a bit more after I washed the completed project. I know denim can shrink a lot and this particular denim was a remnant from an online store that I've only purchased from once based on their hit and miss quality so I should have known better and run the fabric through the dryer at least twice. Once the skirt was finished, I was eager to wear it that I didn't even take pictures before washing it. Even after shrinking, the skirt still fits a lot better than the original - it's just a tad shorter and more snug in the back than it was. Live and learn. On to the construction. This was my first time sewing denim and I used a few techniques from the Craftsy Designer Jeans class taught by Angela Wolf. My favorite pointers were using hammer to flatten out bulky seams and using the Triple Stitch for top-stitching with regular thread as an alternative to using top-stitching thread. I actually bought some top-stitching thread specifically for this project, but my machine was having problems with tension and after trying a number of things and ruining sample after sample, I just gave up and switched to the triple stitch with my all-purpose thread. That was a lot better. My machine was still a little temperamental because it's on the low end and doesn't handle thicker fabrics as well. Some of the stitches don't sit perfectly on top of one another, but you'd have to look really close and I don't think anyone except me cares. I used the flat-lock seam in the middle of the skirt, as it typical in most heavyweight denim. The exposed inside seams were finished with the serger. The closure design was directly copied from original, but I used sewn in metal buttons instead of the set-in kind. There's also a flat clear button on the inside as per original design and the shortest 3 or 4" zipper I've ever sewn in. For the final touch I distressed the dark wash denim with sandpaper in a few places to get the lighter worn-in look and added belt loops. 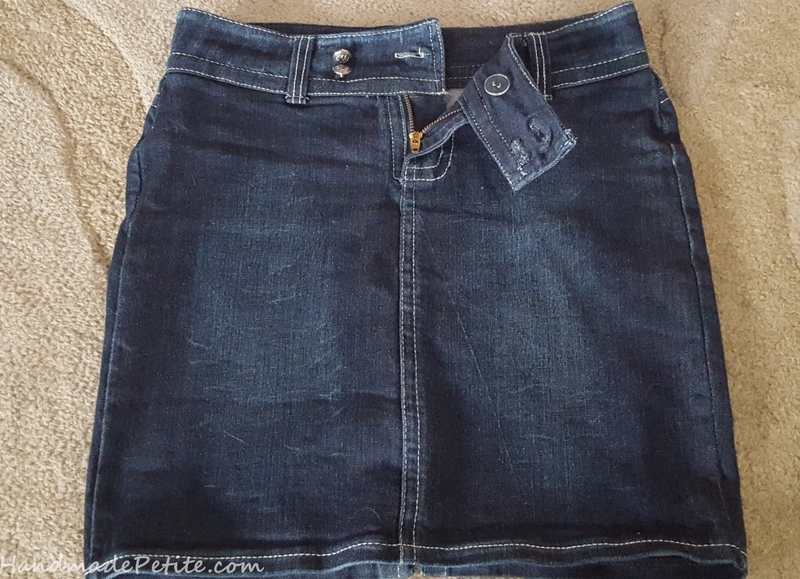 There you have it, my first handmade denim skirt. By the way, the lace tee is also handmade. I made it last year, but it was unblogged. I used a regular t-shirt pattern that came with a knits class I took some time ago. I then cut the front and the back of the pattern across under the arm opening to create 2 pieces. The top is made from stretchy poly lace and the body is organic cotton jersey. The t-shirt was not intended to be tucked in, but I was primarily trying to show off the skirt details in the photos and that caused some weird wrinkles and gathers on the tee that are not usually there. If I were to make it again, I would make the neck and arm bands much narrower, but otherwise the top is stretchy and comfortable. Thanks for reading. Also, if you have a favorite online resource for denim then I'd love to know what to is since I'd like to try a few more denim garments.